Benjamin S. Bloom's (1956) Taxonomy of Cognitive Domain which classifies the order of thinking skills from lower order thinking skills (LOTS) to higher order thinking skills (HOTS) has been earlier refurbished to situate the current learning environment of learners. Formerly, its order was knowledge, comprehension, application, analysis, synthesis and evaluation. In the 1990's, L. Anderson, D. Krathwohl, P. Airasian, K. Cruikshank, R. Mayer, P. Pintrich, J. Raths and M. Wittrock conducted a study on its sustainability and came up with some alterations of the original hierarchy of thinking skills. The proponents' groundbreaking and transitional moves were later published in 2001 thereby exposing the taxonomy of cognitive domain to comprise series of verbs instead of the former nouns that were initially utilized. Words such as remembering, understanding, applying, analyzing, evaluating and creating replaced the terminologies of the order thinking skills. Moreover, the new taxonomy has evaluating replacing synthesis from the old taxonomy with the addition of creating as the highest order thinking skills. 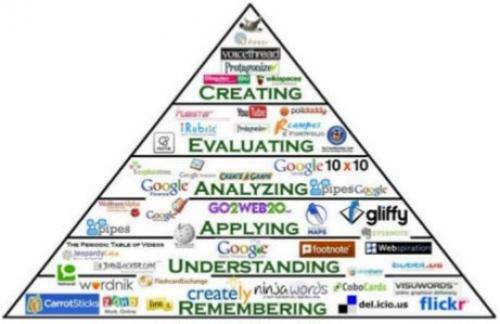 While, the 21st century emerges with technological modifications alongside with the disclosure of mass media forms, Churches further reviewed the Revised Bloom's Taxonomy and created subcategories of digital skills delineating Digital Taxonomy in order to synchronized the intrusion of technologies and media in facilitating 21st century instructions for outcome-based education (OBE). To realize these modern changes, the Digital Taxonomy as a contemporary taxonomy of the cognitive domain began focusing on situating learning in an environment that manipulates technological tools for the enhancement of teaching and learning processes. In here, Churches reformed the LOTS and the HOTS by adding digital verbs to the previously recognized verbs to that of Bloom's original taxonomy through the creation of sub categories found in each ascending order thinking skills. Consequently, the thinking skills contain combinations of previously recognized and digital verbs use for the development of the hierarchy. A few of these thinking skills' examples are found in every classification of the newly formulated order thinking skills alongside digital activities to explain the core of Digital Taxonomy. Initially, Remembering means the employment of a learner's memory to create meanings, state facts, list, and state or recover materials or its sources. It includes, googling, labeling bookmarking, bullet-pointing, listing, matching, naming among others. To elucidate this through a digital activity, a student Googles the YouTube to search a video of a solar system. He further bookmarks the URL to remember the source of his learning material, when he needs the video, he Googles for easy access of the site. He operates his thinking skills by doing these technologically- related tasks. Secondly, Understanding refers to the productions of meanings from different kinds of uses. These implications maybe expressed in written forms or in diagrammatic ways. Subscribing, tagging, tweeting, sharing, commenting, comparing, contrasting, discussing, discovering, expressing, and explaining and many more. As an example, one tags a picture from the Internet source that he may have subscribed or accessed to appear on his Facebook. He comments to express his thoughts for his friends to read. He can share what he has tagged. The processes like subscribing to an online international journal, subscribing to job advertisement site, signing up to emails, availing messenger are some forms of digital understanding. Additionally, Applying is utilizing learned resources through recreations, reproductions, performances among others. Editing, uploading, painting interviewing, choosing, collecting, carrying-out, dramatizing, transforming; for instance, uploading a resume to an email or a website to apply for a job or a research student may wish to upload his research papers in an international journal for further editing before it is accepted for publication. Editing of a script before submission, picture painting using the Paint application, shortening a film through editing, putting captions on films, pictures and posters. Furthermore, Analyzing is tantamount to splitting the materials into smaller parts to understand the relationships of these parts to the whole. Advertising, appraising, categorizing, dissecting, calculating, deducing, elucidating, differentiating and outlining. To illustrate, after a researcher gathers his bibliographic sources, he classifies each source according to subject areas, topics or the types of sources. A student may have watched a film and by structuring the elements of the films, he creates an outline as his approach to write a film review or a student watches a film version of the Tales of Two Cities by Charles Dickens and breaks the story into sequence of events. With the use of a timeline, one can relate the important dates and events that comprise the whole story. The events alluded to history can even be further researched over the Websites applying more interwoven thinking skills apart from merely analyzing. Moreover, Evaluating denotes assessment/measurement based from accepted formulated principles. Revising, commenting, concluding, convincing, judging, assessing, justifying, validating, and reviewing. To exemplify, a student revises his research papers' documentations after noticing some errors in the bibliographic entries. To resolve the problem, he follows the guidelines of documenting sources from the American Psychological Association (APA). Mass communication students made a music video. Upon watching their project for the first time, they noticed that the voice of the performers do not synchronize with their actions onscreen. They also noticed that there are distortions in the musical scoring. The group revised what they have initially made. Finally, Creating represents the assembling of the related elements together to form the whole or production. It includes blogging, building, animating, developing, devising, integrating and inventing. To typify, a student mixes a musical background to a short film project with the integration of subtitles for audience to fully understand. At the beginning and ending of his video project, he builds opening or closing credits by creatively embedding animations in varied movements. Aside from a short film, there can be many digital activities that one can produce such as a voice over for a school video, blogging interesting articles on websites, creation of cartoon animation, PowerPoint presentation with the integration of text, video, effects and transitions; extracting scenes from long films and remixing two films together and so on. One concrete example that generally elucidates the interconnections of the Digital Taxonomy's order thinking skills is the varied E-learning systems that introduces great deal of collaboration. To be specific, the Blackboard enhances the digital thinking skills of the students as they approach the processes in performing the tasks assigned by the teacher. Some of these significant procedures manifest the inter-linkages of the order thinking skills such as opening the computer, surfing the Blackboard site, opening their Blackboard account when logging in, reading the Blackboard menu before proceeding to the next step, searching for the files in audio and in visual forms, recognizing the color codes the teacher has used to classify the nature of the file, connecting to URL where the lessons are connected from the websites, downloading the files to obtain personal copies, answering varied types of test uploaded, construction of projects files such as video and PowerPoint presentation and uploading these project files, checking marks as results of their performance, printing a copy of the files, saving the files in external disc to obtain personal copies, creating audio - visual projects and uploading them for their instructors to check, bookmarking the URL for easy access and connecting the computer to a projector when reporting is required in the class, among other tasks that determine the level of their thinking skills. In other words, the Blackboard LMS yield multiple interconnecting thinking skills from Bloom's Digital Taxonomy yielding remembering, understanding, applying, analyzing, evaluating and creating. As technologies globally deliver other inventions capable for instructions, media will constantly be the substantial partners in the evolution of learning. As evidently observed, innovative educators can't help but advocate through these tools' incorporation to facilitate learning in all areas of disciplines in the academe. The status of education today will be a prelude of further development depending on what technologies offer for the future generations. The meantime as far as they currently exist, they define what digital taxonomy is for the progress of the 21st century learners. The Digital Taxonomy as a contemporary taxonomy of the cognitive domain began focusing on situating learning in an environment that manipulates technological tools for the augmentation of teaching and learning processes. In here, the teacher utilizes authentic materials that are within the learners' surroundings which do not only drive their curiosity and interest but allow them to absorb knowledge of the contents as well as increase their modern day abilities in manipulating the forms of technologies as demanded globally by the breakthroughs of the modern times. This article also reveals that Churches made some favorable transformations of learners' thinking levels by the addition of digital verbs to the originally identified verbs from that of Bloom's initial taxonomy published in 1956. In here, Churches created sublevels containing action words that learners should render in the performance of the learning tasks for the enhancement of their reasoning aptitudes. While learners operate technologies, they activate media forms. Thus, Engagement of these two components facilitates learning while their reasoning are boosted into higher stages.